Total Area Coverage: West to East Bhutan, 11 districts, 22 birding areas. Get sightings of some of the world’s birds that have reached the brink of extinction or are endemic to Bhutan only. Experience the delights of seeing birds like the Satyr Tragopan, Ward’s Trogon, Himalayan Monal, Blood Pheasants, Beautiful Nuthatch, Ibisbill, Rufous-necked Hornbill, White-bellied Heron, varieties of Wren Babblers, and others. Also see mammals like the Golden Langur, Common Langur, Capped Langer, Goral, Himalayan Black Bear, Golden-throated Martin and Flying Squirrel. Other opportunities include Bhutan’s places of historical and cultural interests plus amazing mountains, landscapes, flora, and unique lifestyle. We will leave very early for Chelela pass (3,890 m), a cool alpine meadow carpeted with beautiful alpine followers and stunning landscapes. This is the highest road point in Bhutan. We will comb the area for pheasant species like the Kalij Pheasant, Himalayan Monal and Blood Pheasant. We will have sightings of Laughingthrush, Rosefinch and Grosbeak. After lunch back at our hotel in Paro, we will take a three-hour hike to the Tiger’s Lair or Taktshang, a famous 17th century temple built on a sheer cliff-face. Towards evening, we take the hour-long drive to the capital city, Thimphu. 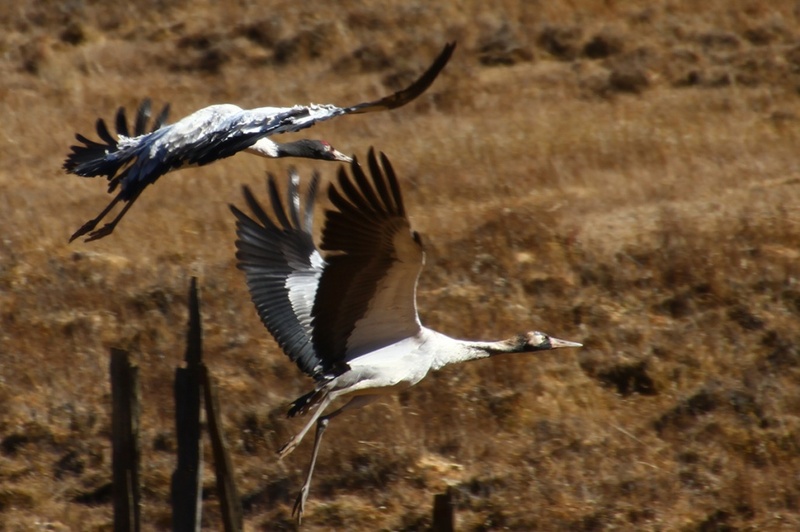 The highlight of our visit to Phobjikha, however, is the Black-necked Crane. As the bird’s biggest wintering ground, we should be able to sight many. Afterward, we will visit the Information Centre for the crane and also take time to see the majestic 17th century Gangtey monastery, the seat of Buddhism’s Peling tradition.